Lonmin's Annual General Meeting is in London on 25 March. 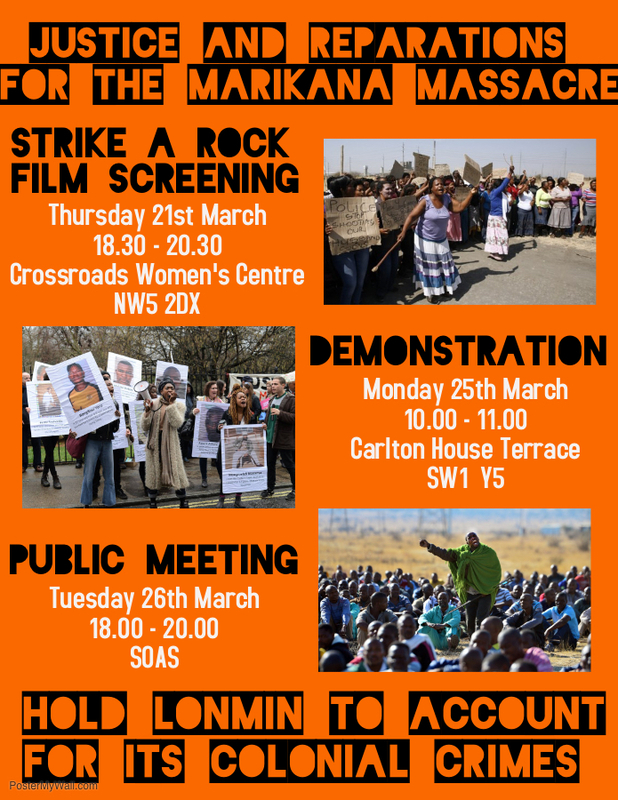 Join us with the London Mining Network, Decolonising Environmentalism and frontline campaigners from South Africa at a protest to hold Lonmin to account for their complicity in this atrocity! 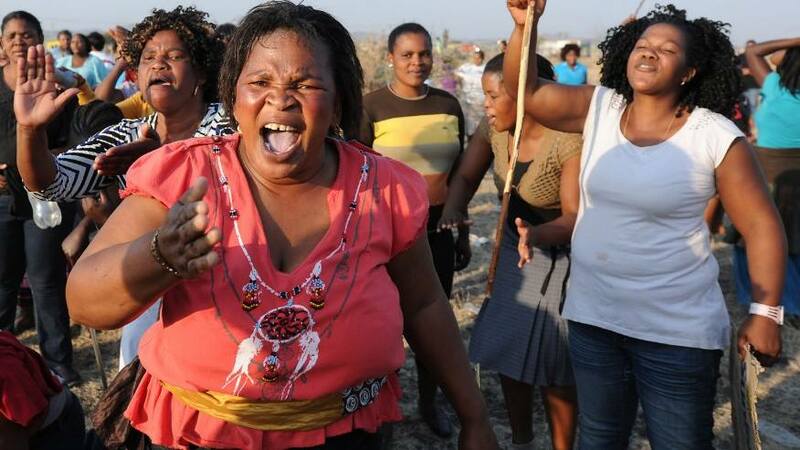 On August 16th 2012, over 100 workers on strike for a living wage at Lonmin platinum mine in Marikana were shot by the South African police, killing 34. This was the single most lethal use of force against civilians since the massacre of students during the Soweto uprising in 1976 under the apartheid regime. Lonmin, founded as Lonrho in 1909 during Cecil Rhodes's brutal white supremacist occupation of Zimbabwe, is at the centre of this violent extraction of Africa's natural resources. It was responsible for colluding with the state to order the police to use force to suppress the miners' demands for basic rights, safety and dignity. Since the massacre, Lonmin has facilitated the intimidation, criminalisation and incarceration of miners and their families. Many are still imprisoned for their actions during the strike, while the corporation's criminal executives and complicit shareholders continue with impunity. Instead, they profit from these conditions of social and ecological violence which led to the massacre in 2012. Lonmin has delayed its AGM because it is on the verge of being taken over by Sibanye-Stillwater, a multinational with one of the worst labour and environmental records in the South African mining industry. Thousands of jobs are threatened, the loss of which would have a devastating impact. Even more acute costs are carried by African womxn and nature, the super-exploited, unpaid labour that underpins racial capitalism's global geography. Workers are worried that when Lonmin disappears as an entity, no-one will be held accountable for its crimes or responsible for repairing the damage. With London as the hub of global mining and finance, we appeal not to the City, but to the people of London to act and join frontline communities resisting British imperialism, militarism and neocolonialism in demanding justice and reparations for Marikana. Amandla! A social covenant with specific time-frames must be made between the company and the entire mining community, not just with the investors. Visit waronwant.org/justicemarikana for more information.